The National Métis Veterans' Memorial Monument has been engraved in honour of all Métis veterans. The monument has taken years of planning and fundraising. 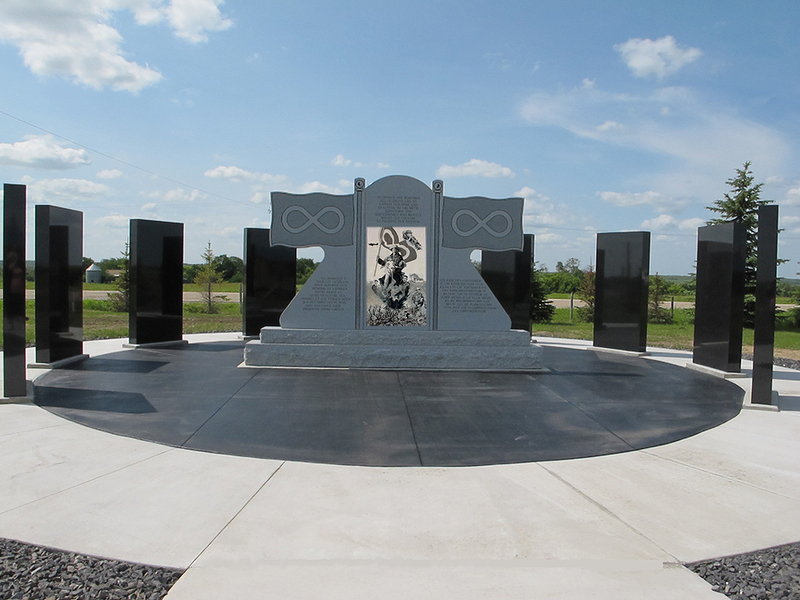 It was first unveiled in July, 2014, marking the achievement of its installation at Batoche. The names of veterans have been collected over many years of research and collaboration with others as well as submissions from the friends and families of Métis veterans. While it is sad to acknowledge that thousands of Métis deserve the inscription, we are proud to honour and commemorate over 5,000 veterans with this first engraving on the monument. Fundraising for the monument's upkeep and future engravings will be ongoing so veterans who are unknown to us at this time can be added in years to come. The monument will forever be a place to pay our respects to Métis servicemen and servicewomen. This app has been created in order to bring the monument to all Métis across Canada, including those who are unable to travel to Batoche to see the monument in person. This will also be helpful as visits to the monument are unguided for the most part. Through the app, you can search the full list of over 5000 veterans and then see where each name is located on the monument. You can also share veteran's names with friends and save veteran's names in order to see their place on the monument at any time. A Métis Veterans information submission form is available at: www.gdins.org/metis-culture/veterans-monument.